Download the FREE Christmas Printables and Holiday Savings Guide from Passion For Savings. This Free eBook and Holiday Planning Pages are available exclusively to Passion For Savings Email Subscribers. You will need Adobe Reader in order to download and open the PDF Files. This is a free program available here.free program available here. Sign Up for Email Updates – Each night we send out the best deals on Christmas Gifts via email. Signing up for this list can save you So Much Money! You’ll find awesome deals on just about everything delivered straight to your inbox each day. Search for Coupon Codes – Don’t shop online before you search the Coupon Code Database filled with thousands of Coupon Codes and updated daily! Before you make a purchase make sure you search the Coupon Code Database to save money on just about any online purchase. You will also frequently find Free Shipping Codes and discounts in the database. Use Coupons – There are so many coupons available this time of year so even if you aren’t a typical coupon user this is a great time to start watching for coupons. We typically see coupons for retail stores such as Bath and Body Works and all of the major retailers like Target, Kmart, & Toys R Us have coupons in the Toy Books released at the beginning of November. I post Toy Coupons as often as I can find them so keep your eyes open for high value coupons and grab them while they are available. There may not be a deal on those toys immediately but over the holiday season we see almost all toys go on sale at some point. Do your research. Know what a good price is for an item, typically online sites have higher “Retail Prices” listed which doesn’t mean anything. Don’t fall for the 80% off claims because the retail price might be inflated. This is where it pays to do a little research and know what the going price for an item is. Shop Thanksgiving Week & Thanksgiving Day. Retailers want to get your money BEFORE you get in the stores on Black Friday so some of the best deals online happen during Thanksgiving Week. Make sure you check in frequently during this week and scroll through all the deals because we will be posting everything we find. Stack Coupon Codes. Some retailers allow you to stack coupon codes for Free Shipping with Discount Codes. For Example: Kohl’s allows up to 2 promo codes per order as long as one is for Free Shipping and one is a % off Discount. Don’t forget about that handy Coupon Codes Database where you can search for Online Codes for just about any store online! Use Rewards Programs. A lot of companies have Free Rewards Programs that allow you to earn points or get special coupons. You will want to sign up for these programs because you can save a lot of money through special bonus points offers and exclusive deals for members. Future Purchase Discounts. A common trend at retail stores is to offer you “Store Cash” like Kohl’s Cash or Old Navy Cash when you make a purchase. This encourages you to come back and shop again at the same store. Don’t forget to factor those discounts into your purchase decision, you might find an item is the same price at multiple stores but one store offers future purchase discounts making it a better deal. This happens a lot with sites like Best Buy, Old Navy, and Kohl’s so keep your eyes open for these deals. Shop One Day Deals. Old Navy, Toys R Us, Target, Gap and other retailers frequently offer One Day Only sales during the holidays. You can score some great deals by grabbing these one day sale items but remember not to impulse shop. Often the One Day Sale Item Price is the lowest price you will see during the holidays. Shop Early. During the holidays hot items will sell out fast. Make sure you shop early in the week for the best deals and early in the day for daily deals. These times are optimal for having the best selection of sale items to choose from. Also remember to ask for a rain check if an item is out of stock, which will help you avoid paying full price for the item when it comes back in stock. Stack Coupons. Most stores allow you to use an in store coupon with a Manufacturer Coupon. This is a great way to get double the savings! Don’t forget to ask for the coupon policy at your local store or research it online to double check before heading to the store. Target for example allows you to use 1 Manufacturer Coupon + 1 Store Coupon + 1 Cartwheel Coupon. That’s 3 discounts on top of a sale price which works out to some awesome savings! Price Match Online Deals. The larger stores are trying hard to be competitive with online retailers during the holidays. Stores like Walmart, Target, Toys R Us and Best Buy have online price match policies during the holiday months. Price match online deals in stores to avoid paying shipping fees, or stack online prices with Manufacturer Coupons by price matching at Target or Walmart. If you would like to download each page individually you can click on the images below! Holiday Budget Worksheet – Use this list to help you plan for all the items you might need during the holidays. Everything from new Christmas Trees, Decorations, Charitable gifts and postage for mailing holiday gifts make sure you plan ahead for all expenses you expect to encounter during the holiday season. Christmas Gifts List – This list will help you keep your shopping organized. 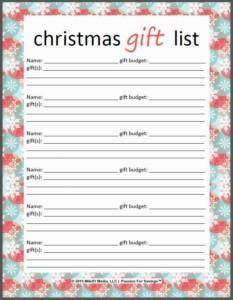 Write down the name of each person you need to buy a gift for along with ideas for each person and your holiday budget for that person. You can cross out each section as you finish shopping for that person and you’ll have a running list of what items you still need to purchase. Black Friday Shopping List – The Black Friday Deals are already starting to roll in, use this list to keep up with all your favorite deals and stores as you browse through the ads. Then you’ll know exactly what you need at each store. Holiday Event Calendar – This is the most wonderful time of the year, but it can also be one of the busiest times of the year. Get your family organized by making sure you keep up with all your holiday events. If you don’t already have a calendar you use on a daily basis fill in this Holiday Events Calendar with important dates and parties. Holiday Party Planner – If you’re hosting a holiday event this year use this Holiday Party Planner to brainstorm ideas for dinner, decorations and even the guest list all in one place. 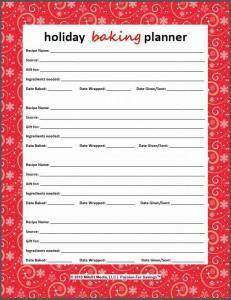 Holiday Baking Planner – I love baking during the holiday season but it’s important to keep up with additional ingredients you may need to buy at the stores to avoid making extra shopping trips (Saving you both time and money). Use this list to plan ahead for your holiday baking to make sure you have everything you need on hand for each holiday treat. Holiday Card Planning List – During the Holidays we see some awesome deals on Holiday Cards. Make sure you are ready for those deals by having your Holiday Card Planning List ready. Write down each family you want to send a card to along with their Address and when the cards are mailed out. You can print this page multiple times if you need additional sheets. Holiday Bucket List – During the holidays it is so important to spend time with Friends and Family. Make a holiday bucket list of things you want to do this year and start marking them off one by one.